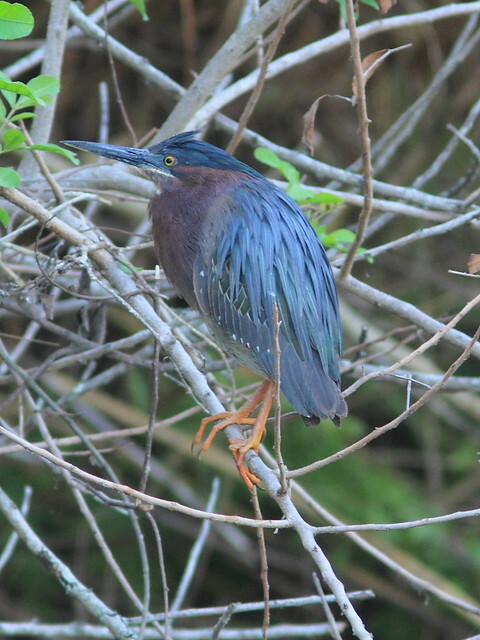 Last season, in the Yellow-crowned Night-Heron rookery along a canal at the north end of the wetlands birding patch next to our south Florida home, a pair of Green Herons selected a secluded spot for their nest. Unfortunately, this tree, which extends over the water, had been treated with herbicides by the agency that maintains the canals, and by the time the eggs hatched almost all the leaves fell off to expose the nest. Movie time! These brief clips illustrate some interesting behaviors and are best viewed in HD, full screen size. Pardon the shakiness, as they are taken with my hand-held DSLR camera with a telescopic lens, from about 30 feet across from the nest. 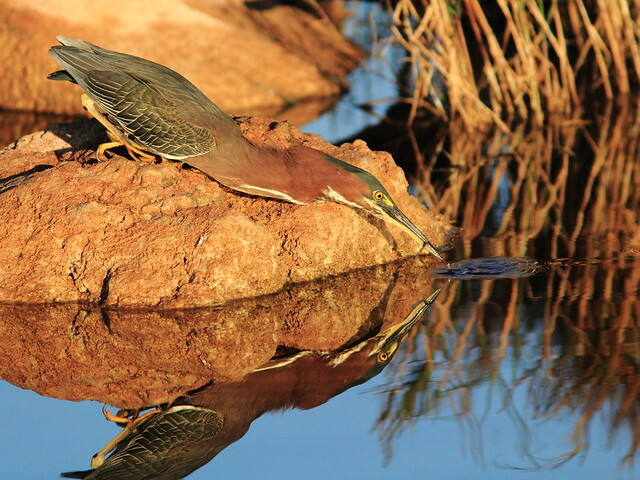 The Green Herons are excellent parents. Here a female feeds her tiny chicks, about 3-5 days old. At the time, we only counted three, as the youngest one was not yet visible (April 15, 2012). The four chicks have grown quite a bit over the next 3 days. They are now 7-9 days old. Perhaps not unexpectedly in view of the flimsy perches, the smallest chick disappeared the next day, following a heavy thunderstorm (April 19, 2012). Now on April 22, the chicks are 10-12 days old. This remarkable sequence shows the protective behavior of the male, who had fed the chicks just moments before I started this video. The female then flew in with more food, but the ravenous appetite of the chicks placed them in danger. The male, sensing their predicament, flew in to solve the problem. See how he did it. ...or a spindle-shaped pointed object. But where did that neck come from? 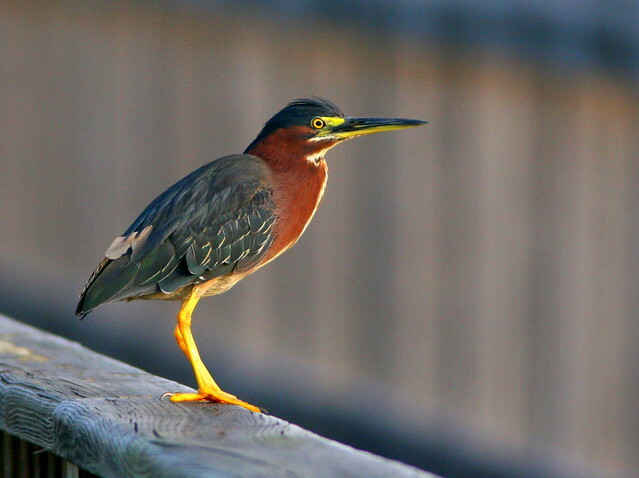 Sometimes it looks like almost any other heron, though its legs are short and its neck is a bit fat. ...and raises a handsome crest. Their color-- How did they ever get the name of "Green?" Sometimes they look as dark as crows. 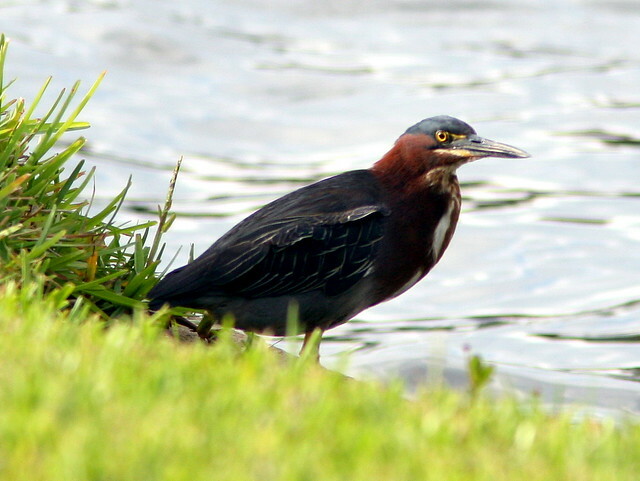 The immature birds have streaked underparts and can be quite dark in color. Here is an adult. Why, I do see a bit of green in there! Usually a loner, it is unusual to see several in a flock. These are immature birds. perhaps some are siblings. Those wings-- they are surprisingly long and seem to have so many more feathers than expected! 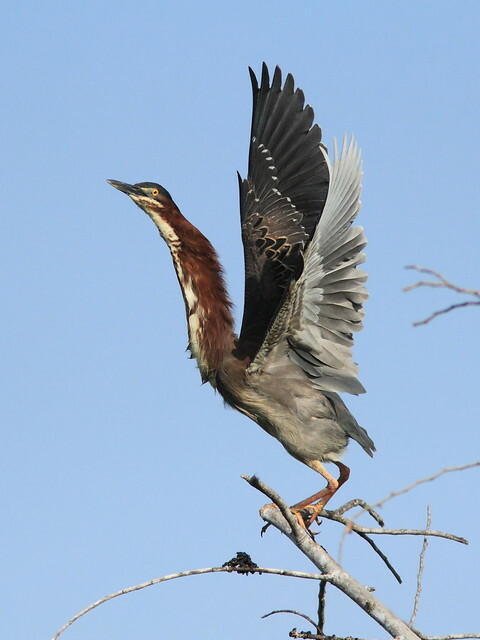 During breeding season, the male does have respectable plumes. Where does that neck go...one of nature's greater mysteries for sure. 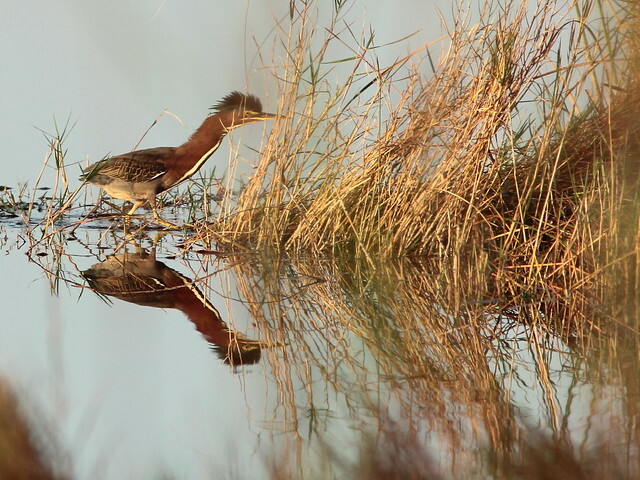 Very cool photos and video about an awesome species. Great post Ken! 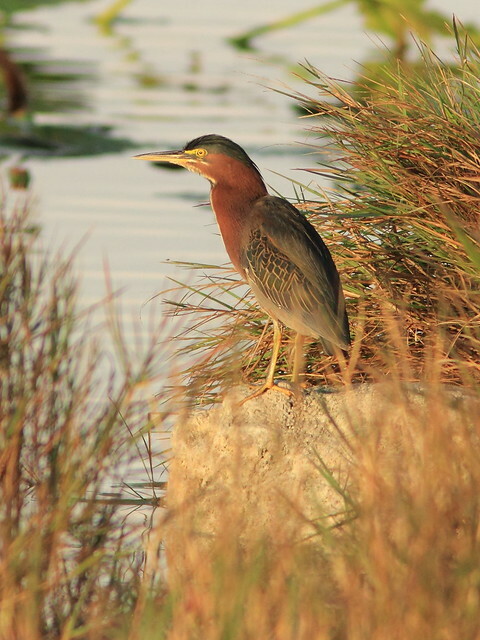 Love the Green herons. Great shots Ken! Wonderful post, Ken! 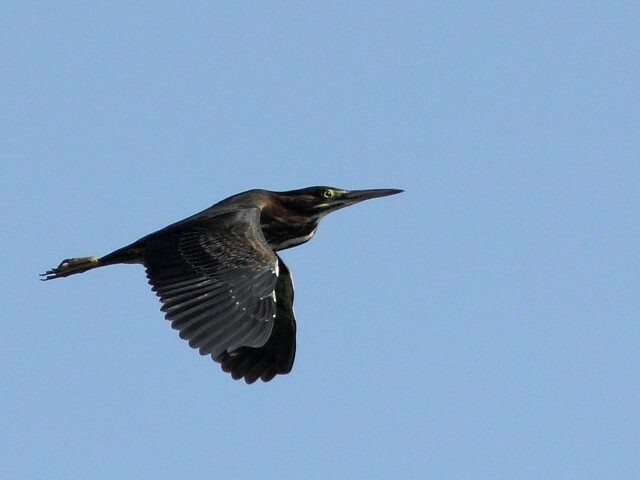 The impressive neck and wings of the bird taking off look strange - that's what a camera is good for, catching those aspect we never see with our naked eyes. 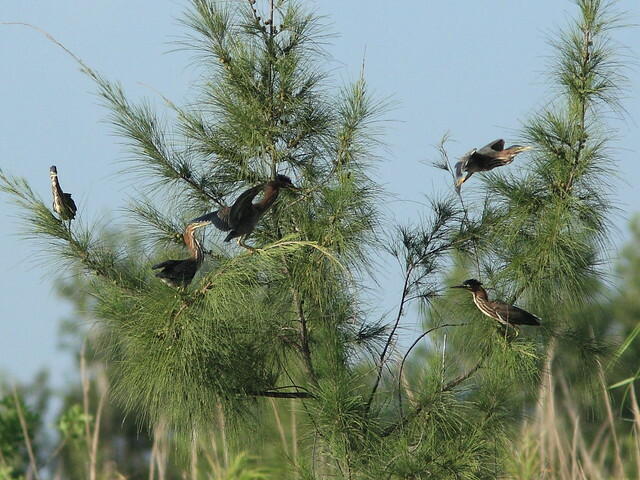 We had a Green Heron pair raise their young in a pine tree behind our house. One day I saw the 3 fledglings line up on a tree limb and slowly shuffle toward the end. They looked like a troupe of clowns! Arriving at the end of the limb they took off and I never saw them again. 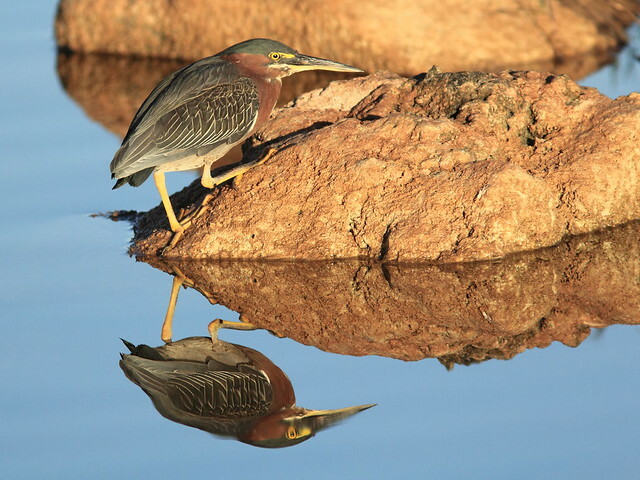 Fantastic videos and photographs, Ken! 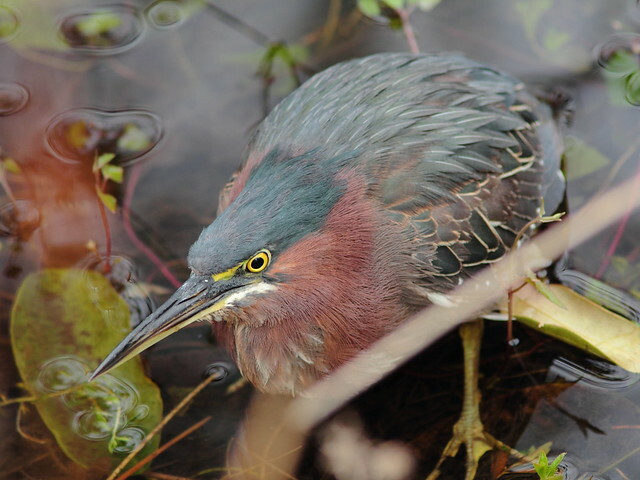 I have never seen Green Heron chicks before so it was especially fun to view your great videos. So glad that the male came to the rescue of those hungry babies. 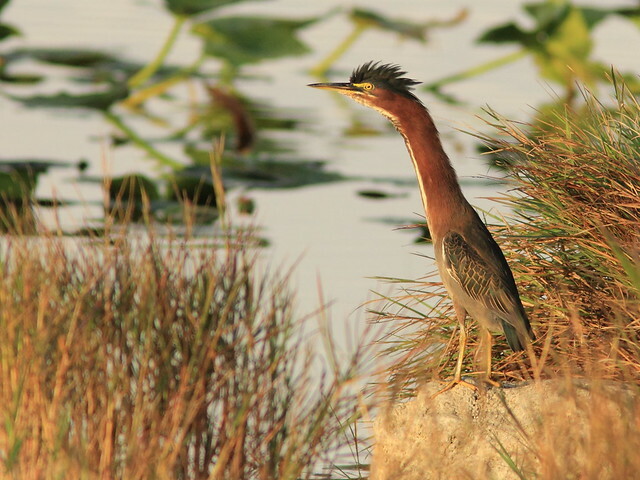 During breeding season, their plumage is just gorgeous. Excellent post!